sweet hills of the Lago Liscia. It's definitely recommended to nature lovers who want to discover the heart of Gallura. Ideal for couples of all ages looking for peace, contact with nature and time for themselves. Aldiola Country Resort is located on the hills overlooking the lake Liscia in Sant'Antonio di Gallura, near the Costa Smeralda. The hotel offers a beautiful natural relaxing setting, surrounded by the colours and scents of typical Mediterranean plants and shrubs. It is only 18 km from the sea and less than an hour from Olbia Costa Smeralda Airport. 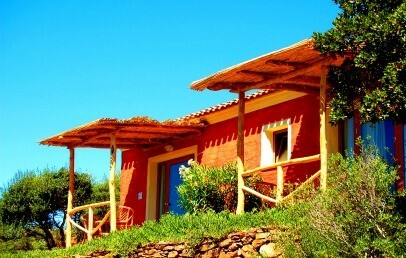 Furnished in typical Sardinian style, the Aldiola Country Resort reflects the characteristics of Gallura ancient houses. Its most important characteristic is its location, nearby but away from the bustle of the Costa Smeralda, surrounded by nature and ideal base for visiting the coast as well as the interior landscapes of Gallura. Guests can choose between three types of rooms differing for the view they offer: the Standard overlook the garden, the Classic have garden view and partial on the lake, Superior have lake view, Junior Suite have spectacular view over the lake and can accommodate up to 4 people (2 adults + 2 children). The interior furniture follows the Gallura style characterizing the entire structure: everywhere are typical woods, ceramics and fabrics of Gallura. 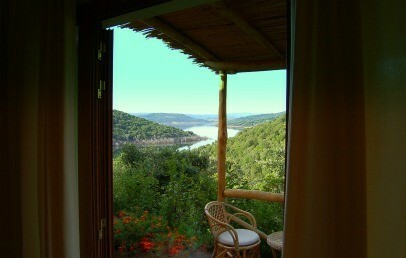 Each room has a small veranda with sitting area, where guests can relax comfortably and enjoy the contact with nature. The devotion to the tradition is nicely combined with the modern comforts: each room has air conditioning, satellite TV, free Wi-Fi and safety box. The comfortable dining-room of Aldiola Country Resort, with its large windows overlooking the pool and the big terrace with view over the lake "Liscia", welcomes the guests in a comfortable and relaxed setting. The dishes, prepared with fresh ingredients, range from regional to national cuisine and are always accompanied by excellent wines. Aldiola Country Resort offers a small outdoor fitness corner and the possibility to book relaxing massages (on request). Free Wi-Fi is available throughout the hotel. Outdoor swimming pool and green areas for walks and moment of relax in contact with the Sardinian nature. 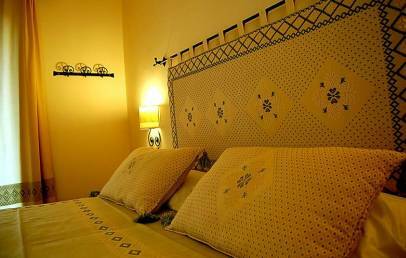 Double room are furnished in typical Sardinian style and reflects the characteristics of Gallura ancient houses: woodwork, linens and ceramics are created by the Island’s finest craftsmen. 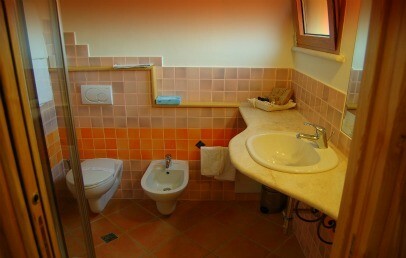 The private bathroom provides shower and hairdryer. All Standard Rooms face a patio with a comfortable lounge area and have a garden view. 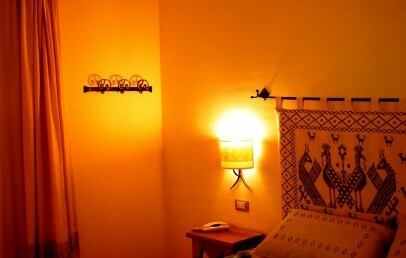 Double room are furnished in typical Sardinian style and reflects the characteristics of Gallura ancient houses: woodwork, linens and ceramics are created by the Island’s finest craftsmen. The private bathroom provides shower and hairdryer. All Classic Rooms face a patio with a comfortable lounge area. They offer a garden view and a partial view of the Liscia Lake. 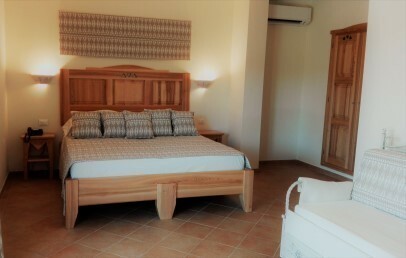 Double room are furnished in typical Sardinian style and reflects the characteristics of Gallura ancient houses: woodwork, linens and ceramics are created by the Island’s finest craftsmen. The private bathroom provides shower and hairdryer. All Superior Rooms face a patio with a comfortable lounge area. They offer a Liscia Lake view and free wi-fi connection in wi-fi zone. 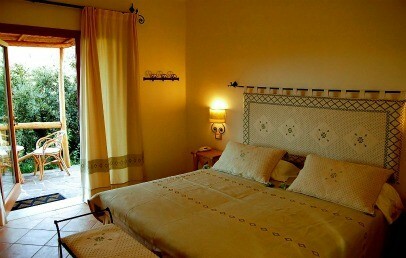 The rooms are furnished in a Sardinian style with a cosy sitting area. The bathroom has a shower, hairdryer and courtesy set. A large furnished terrace offers a spectacular view of the lake. The Junior Suite suitable for a family have moreover a single sofa bed or a bunk bed for children. The maximum occupancy is 2 adults + 1 child + 1 baby or 2 adults and 2 children. 20% reduction! Not refundable rate; prepayment required upon confirmation.